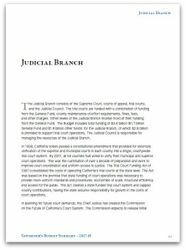 Given the uncertainties in the state’s budget in the coming fiscal year, Governor Brown’s proposed budget for the judicial branch is prudent. The Governor’s proposals would provide funding to offset declines in other revenue, assist with trial court case management systems, and contribute to trial court employee health and retirement benefits costs. We will continue to press for additional trial court revenue and any other necessary changes to address the vital needs of those seeking justice in the court system.